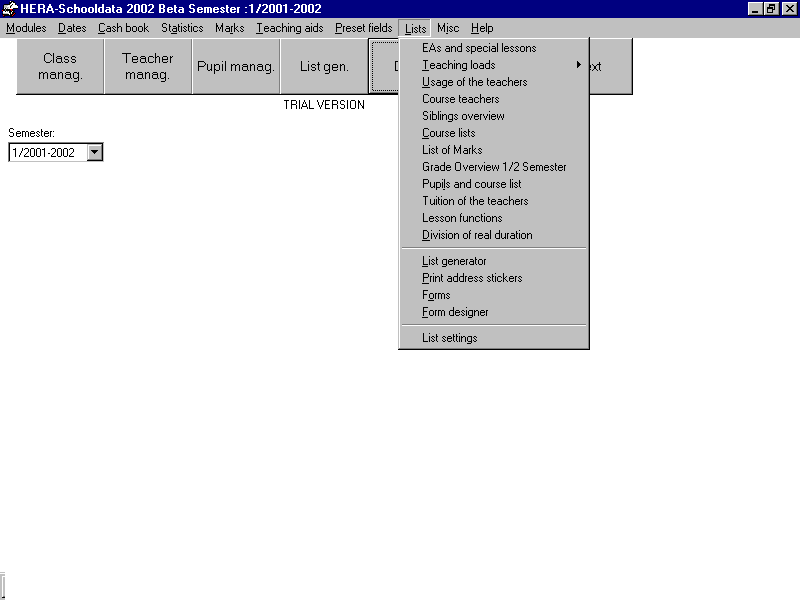 This is the main menu for List Management of HERA. For a description of the buttons please scroll down. This is the main menu for list management of HERA. : This menu has Following submenus. : It will open a window for printing extracurricular activities and special lessons . : It will open a window for viewing adding and editing reminders. : It will open a window for printing to show a teacher is teaching which courses and how many number of pupils. : It will open a window to print course teachers and duration for each teacher. : It will open a window to print List of siblings in school. : It will open a window to print List of courses for a chosen class. : It will open a window to print List of marks for a selected class for the courses selected. : It will open a window for showing gradings of pupil in half semester. : It will open a window for adding/Editing/deleting a List. : It will open a window for printing address stickers.